Shark Tank's Mark Cuban Comes To SHOPHQ! Mark Cuban, investor,entrepreneur , owner of the Dallas Mavericks, and most recently one of the 6 stars of ABC’s Shark Tank, has brought to SHQP one of the products that made it’s debut on the show. This item first appeared in Europe, and later was redesigned by entrepreneur Mary Beth Lugo and brought to the attention of Mr. Cuban and the other sharks for investment. The KaZAM® Children’s Balance Bike with Adjustable and Handlebars replace the old bicycle with training wheels or more daunting method of teaching your child to ride a bike by running beside him/her on the bike and helping to balance. Balance is the key to riding a bike successfully and the KaZAM® does this in short order creating instant fun and exercise for your child minus the potential parental heart attack! It’s available at SHOPHQ for $79.09 +SH $11.99 on 3 Valupays. Comes in 4 great colors of Red, Blue, Green and Orange. Ages 3 and up. Buy now and save for the Holidays! Some Press Dough reviews talk about how poor the cookies turn out. But most reviews do not tell you why OR if you can fix this issue. As it turns out, we found out why–and we will tell you how you can fix this issue. You see, not all cookie doughs are the same! In fact, if you use traditional recipes–or the store-bought recipes–you’ll likely find the cookies lose their shape in the oven. In the, end the cookies do not look anything like the character they should represent. This may lead to disappointment. And judging by other consumer reviews posted about the Press Dough–this is the most common complaint. As it turns out, you need to use spritz cookie dough recipes. Spritz cookies are not uncommon. In fact, if you were to use a professional cookie press–you will most likely use a sprintz cookie dough recipe. This is because ‘spritz’ is German for ‘squirt.’ And that is what you can do with spritz cookie dough. Refrigerate the dough for 15 minutes before cooking. Press Dough Cookie Maker, Does It Really Work? It works surprisingly well if you use the right cookie dough — and the kids just have fun for hours. Bottom-line: Buy this for fun–but use the right dough. Adults Will Fight The Kids To Play With These Hot Toys! It use to be up, up, and away in my beautiful balloon. Now it’s up, up, and away in my beautiful flying saucer. The coolest flying toys offered by Vectron, has this new addition that can be controlled by your palm. Automatic sensors keep tabs on the distance to the ground to keep it hovering. This latest interactive toy comes with 1 vectron, 1 charger, and instructions for hours of fun. Comes in blue and orange. 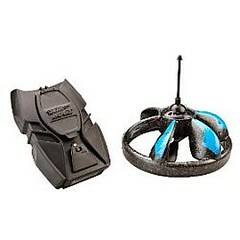 For the big kid in your life, check out the Vectron Blackhawk Flying Saucer that hovers, dives, and climbs. Four years in development, it uses the latest US Air Force technology. The surrounding ring features an LED display into which you can program up to four separate 30 character messages. These can be changed while the Blackhawk is flying. Additional green LEDs run along the top and bottom of the ring. 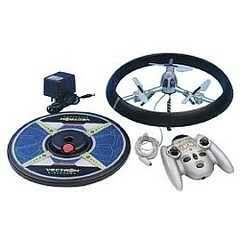 The flying saucer is tethered by a command line that sends the power and commands to the Blackhawk, eliminating the need for batteries. (The docking station plugs into any AC power outlet.) The command line can also be threaded through the docking station to your specified length which prevents the flying saucer from flying off out of control, so you can fly it safely even in the smallest of spaces! A training feature steps in to prevent crash damage, making learning to fly the Blackhawk a piece of cake. It also features a turbo mode that makes the controls more sensitive and an autopilot mode that controls the Blackhawk hands free. A safety feature is included that stop the propellers automatically upon contact with any object. At Amazon for $49.95. Remember, Providing Hours of Fun, Means Keeping Kids and Hubby Out of Your Hair! Isaac Asimov once said, “I do not fear computers, I fear the lack of them.” Certainly, we live in a digital age that Asimov would approve. We have robots that will vacuum and clean our floors (iRobot and Scoomba), navigate us through highways (GPS), and even make a grocery list when we need to restock our refrigerators. MDM has found the newest and hottest robot models that are sure to make you smile. 1) Gibson Robot Guitar. Gibson has created the first robotic guitar. The Gibson guitar tunes itself (tune control bridge) so that you will never have to worry about playing a sour note. Also, the Gibson guitar contains a lithium battery that when charged for 90 minutes allows the player to use for 200 tunings. Since this is the first ‘run’ with the robotic guitar, supplies are limited. The Gibson Robot Guitar is valued at $2,499. 2) Liquid Image Scuba Goggles. Don’t you love underwater photos? Now you can feel like a photographer for National Geographic with the Liquid Image Underwater Digital Camera Mask. The camera mask features 3.1 mega-pixel photos and video and it is easy to use! Simply connect mask to your computer with a USB chord, no additional software is required. To purchase camera goggles e-mail sales@Liquidimageco.com. Orders are currently being placed for March 2008 shipments. 3) Brian the Brain Interactive Digital Roommate. This is a great robot for kids that will actually help in their education. Brian the Brain, sold by Sharper Image, is an artificial intelligence (AI) system that will help with homework, play games and tell jokes. He contains the entire Encyclopedia Britannica, history timeline, personal organizer, and much more. Brian the Brain is valued at $119.95. Despite the start of the New Year, sales on holiday items and other merchandise can still be found in store and online. This is the perfect time to pick up anything that Santa forgot and to start shopping for the next holiday season. JCPenny© is having a holiday clearance sale, featuring 50-70% off. MDM found this great Ipod Nano Bling Case, orig. $24.99, steal for $5.99, in the online outlet store. The bling case is a great way to show off your new tech gear and at this price you can afford to get it in many colors. Ipod Nano Bling Case comes in blue, clear, pink and purple. Macy*s© is also having a holiday clearance of 20-65% off. The major steals are to be found in women’s apparel. Big, bold colors are hot this year and the Miss Chievous Colorblock Emma Top, orig. $28.00, steal for $8.40, fits the ticket. The Emma top looks great with black leggings or dark wash denim. Top comes in plum/black or whipped cream/ black, sizes small – large. Kohl’s© has fantastic savings on men’s apparel, 60-80 % off. MDM found Chaps 3 pack of ribbed brown dress socks, orig. $14.00, steal for $2.80. With the sock monster running rampant in the laundry room, this is one bargain you can’t afford to lose. Toys R Us© has a 60% off clearance blowout. This is a great opportunity to pick up toys for future holidays and birthdays. MDM likes the Imaginext: Motorized T-Rex Gift Set, orig. 32.99, steal for $ 9.98. Gift set comes with T-rex and Pteranodon, appropriate for ages 3-8 years. 3AA batteries are required.